You may recall (or can’t forget) the recent findings about the wonderful inhabitants of BART seats. But preliminary vaccinations (if they would even work) may not be necessary for all BART riders. Providing at least a small shield between you and the hoards hordes of bacteria, local yarn-bomber Streetcolor has knitted two seats on BART in an effort to brighten up what can be a dreary ride. Here’s to hoping that we’re fortunate enough to score one of these lovely seats. Ever feel like those grey bike racks look a little depressed? Well, yarn-bomber Streetcolor has given one bike rack in front of what used to be Black Oak Books a little bit of a pick-me-up. With works in Palo Alto, Sacramento, San Jose, Oakland and even Paris, Streetcolor tries to keep her identity hidden. That can be a bit difficult when your friends are rascals who, as she says, shout out your real name as they drive past. The location was chosen because Streetcolor sees the bike rack when she goes to The Cheese Board and the Berkeley Farmers’ Market. Yarn-bombing in Berkeley, she says, is like “decorating (her) home.” Maybe the city should hire Streetcolor as our exterior decorator. That’s right, deYoung Museum. 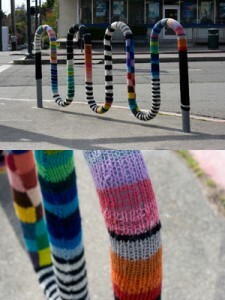 Streetcolor just yarn bombed you. 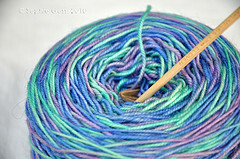 Put that in your uppity “fine art” pipe and yarn smoke it. Er, whatever. Ever pass by a pole in Berkeley, not really paying attention because, well, it’s a pole. 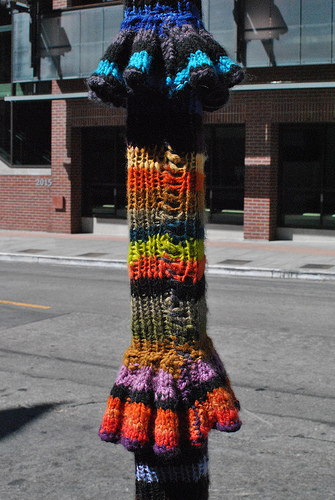 And then just as your about to walk by it, pass it off as just another pole, you halt in shock: this pole is covered in pretty woolen colors. Oh yes, Berkeley and the Bay Area’s community has some valuable members who are so filled with delightfulness (at least we think so) that they want to cover our city in knitted art.